Study 112 world countries while learning about animals, people, places, cultures, religions, food, homes, etc., from the 7 continents. Includes world flag stickers - paste on fact sheets (one set is good for several children). This study is colorful and fun and best done togethr devoting one school day a week to your world study. Try some around the world cooking and crafts! This is a reproducible notebook resource. 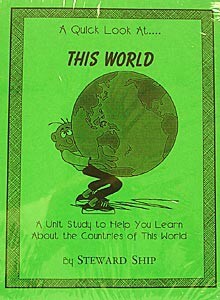 You'll need to acquire informational books as you study each continent. Grades 3-4 and up. From Stewardship Publishing.